This is my column recently published in The Catholic Weekly. In his first official homily as the new Archbishop of Sydney, Archbishop Anthony Fisher certainly painted an inspiring 20-year vision for the Catholic Church in Sydney (which should benefit the whole city). In part, he said that he hoped by the time he retired the city would be one where the “Gospel is preached with joy, the wisdom of our tradition mined with fidelity, the sacraments celebrated with dignity and welcome, and the seminaries, convents and youth groups teeming with new life”. I couldn’t help thinking about this vision through the eyes of family life. Families are in a great position to preach the Gospel, with and without using words; to probe and live out the wisdom of our 2000-plus year tradition; to defend and celebrate the sacraments with dignity; to fill the seminaries, convents, and youth groups with our children, giving them a grand vision of life and then allowing the Holy Spirit to go to work. But, just to look at the first part; where, first, should the Gospel be preached with joy? From the pulpit, yes, but at Mass before the Gospel is read we all mark a little cross on our forehead, lips, and breast, asking that the Word of God be on our minds, lips, and heart. Where? Not in the Church, obviously, but at home and at work for the entire rest of the week, within the family, while out on walks or while driving in the car, playing a game, shopping for groceries cooking a meal, giving a bath – whatever it is that we do with our children. Not preaching or pushing doctrine into them at every opportunity, or when we think we should, but following our children’s interest and just making good use of those little teaching moments that crop up all the time. I’m well aware that this is probably the only time in my life that my children will so keenly want to know what their parents think and believe and care about. This is the only time in his life that four-year-old Jacob will beg me every morning in the car for another story about God. “Tell me the one where Jesus was naughty mum,” he often adds. So sometimes there is some self-projection going on with their comprehension of these stories, but at least they’re enjoying them. And yes, they do want to talk about it now. Things about heaven and hell, sin and redemption, angels and demons, failure and forgiveness. So yes, we preach, and with joy because even in human terms talking about someone we love and admire and the truly awesome things he’s done is a great pleasure and a joy. And we preach to our spouses too – or not preach so much and certainly not in many words, but by how we act with our spouse. But sometimes in words too, for who knows better than my spouse exactly what bit of God’s message I need to be reminded of in a particular moment? When I’ve overdosed on the news headlines and feeling a bit dejected about the state of certain things it’s my husband I complain too, and it’s him who always reminds me that this is precisely the way Jesus said it would be. That we are to be the leaven and the salt that makes things better. This is the vision that Jesus has for our families and our Church, a vision he’s also given to our Pope, our Archbishop and other leaders. We’re on a mission to help them achieve it! 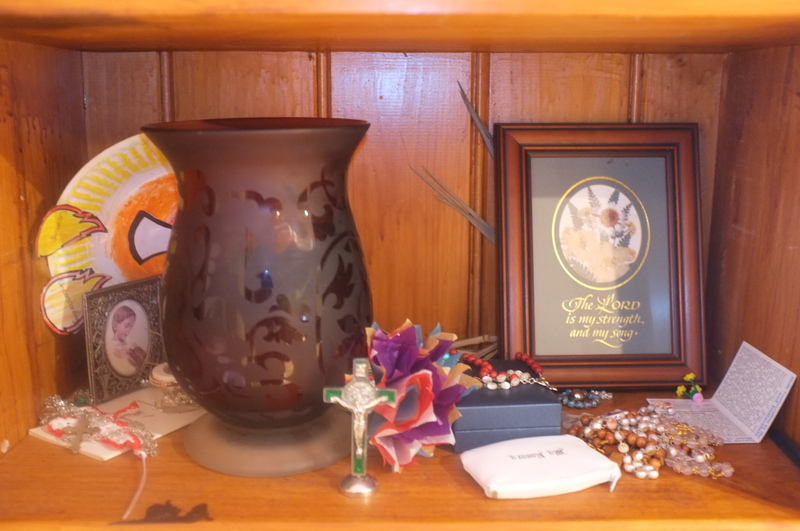 The picture above is half of our sacred space at home, which is basically two small bookshelves. It’s a very haphazard space but it will be revamped a little for the start of Advent! Previous Post Busy? Yeah, me too.